YouTube is one of the most popular video-sharing websites. It's the best online source to watch videos mostly on entertainment, tutorials, education, news, and much more. People can not only watch videos on YouTube but they can also upload and share their own content. Tons of new videos are uploaded on this platform daily. Sometimes we need to download YouTube videos to watch them offline. Unfortunately there is no download button on YouTube to save videos in your device directly. Maybe due to the copyright issue, I guess. Whatever be the reason, now there is a good news for all of us. Launched back in 2014, YouTube has introduced a feature in its mobile apps which allows you to save videos offline so that you can watch them later any number of times. 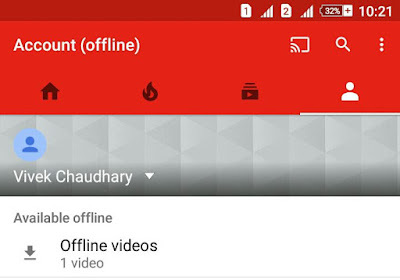 Here I will guide you how to use this feature and save YouTube videos in your device for offline viewing. 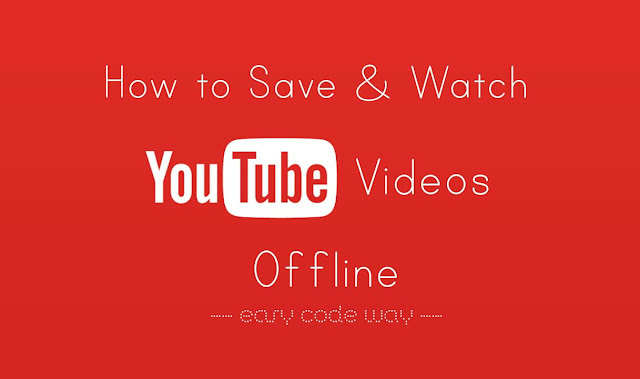 Launch YouTube app and open the video you want to save offline. Now a pop up box will appear where you have to select the resolution (Low, Medium or HD) of the video. Next to each resolution, it will display its size. 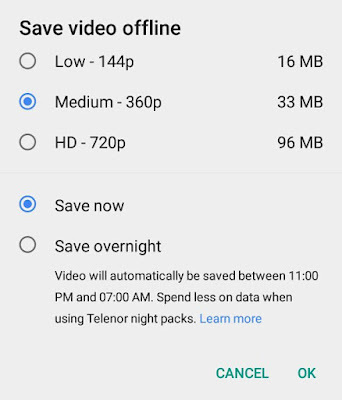 You can also use "Save overnight" option to automatically download videos in night-time between 11:00PM and 7:00AM. After this, tap the "OK" button and video will start downloading in your phone. You can check its progress in notification tab and download section. In the same way, now you can also download complete playlist. When you are offline, open YouTube app. Now move to Account tab (click the user avatar at the top-right corner of the screen). Under Available Offline section, click "Offline Videos" option. Now click the video you want to watch. If you want to delete any video, first tap the option button (three dots) and then click "Remove from offline videos" option. Where does the offline videos get saved? The offline videos you download from YouTube are saved in your phone's memory under Internal Storage/Android/data/com.youtube.com directory. The video's file extension is EXO which is highly compressed and encrypted in such a way that only YouTube app can decrypt it. Unfortunately, you can't play these videos with normal media player apps (such as MX Player) and neither share them with other device. Note that, if you will update YouTube app, sometimes videos may disappear from your offline playlist. First, download and install Airy application on your Mac. Now copy paste the YouTube video link into Airy and choose the video format you want to download. Finally, tap the "Download" button. That's it. If you would like to ask something about this topic, fell free to share it in the comment box.